The Province of Pennsylvania, also known as the Pennsylvania Colony, was founded in English North America by William Penn on March 4, 1681 as dictated in a royal charter granted by King Charles II. The name Pennsylvania, which translates roughly as "Penn's Woods",  was created by combining the Penn surname (in honor of William's father, Admiral Sir William Penn) with the Latin word sylvania, meaning "forest land". 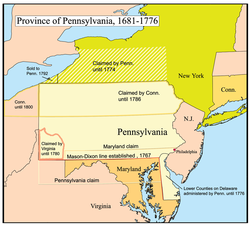 The Province of Pennsylvania was one of the two major Restoration colonies, the other being the Province of Carolina. The proprietary colony's charter remained in the hands of the Penn family until the American Revolution, when the Commonwealth of Pennsylvania was created and became one of the original thirteen states. "The lower counties on Delaware", a separate colony within the province, would breakaway during the American Revolution as "the Delaware State" and also be one of the original thirteen states. Penn, despite having the land grant from the King, embarked on an effort to purchase the lands from Native Americans. Much of the land near present-day Philadelphia was held by the Delaware (Lenni Lenape) who would expect payment in exchange for a quitclaim to vacate the territory. Penn and his representatives ( Proprietors) negotiated a series of treaties with the Delaware and other tribes that had an interest in the land in his royal grant. The initial treaties were conducted between 1682 and 1684 for tracts between New Jersey and the former Swedish / Dutch colonies in present-day Delaware. The province was thus divided first into three counties, plus the three "lower counties on Delaware Bay". The easternmost, Bucks County, Philadelphia County and Chester County, the westernmost. William Penn and his fellow Quakers heavily imprinted their religious values on the early Pennsylvanian government. The Charter of Privileges extended religious freedom to all monotheists and government was initially open to all Christians. Until the French and Indian War Pennsylvania had no military, few taxes and no public debt. It also encouraged the rapid growth of Philadelphia into America's most important city, and of the Pennsylvania Dutch Country hinterlands, where German (or "Deutsch") religions and political refugees prospered on the fertile soil and spirit of cultural creativeness. Among the first groups were the Mennonites, who founded Germantown in 1683; and the Amish, who established the Northkill Amish Settlement in 1740. 1751 was an auspicious year for the colony. Pennsylvania Hospital, the first hospital in the British American colonies,  and The Academy and College of Philadelphia, the predecessor to the private University of Pennsylvania,  both opened. Benjamin Franklin founded both of these institutions along with Philadelphia's Union Fire Company fifteen years earlier in 1736. Likewise in 1751, the Pennsylvania State House ordered a new bell which would become known as the Liberty Bell for the new bell tower being built in the Pennsylvania State House in Philadelphia. William Penn had mandated fair dealings with Native Americans. This led to significantly better relations with the local Native tribes (mainly the Lenape and Susquehanna) than most other colonies had. 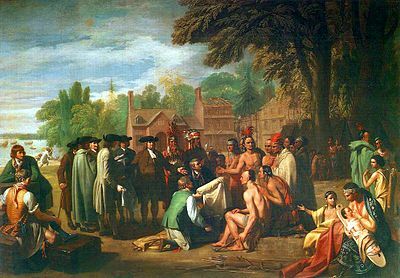 The Quakers had previously treated Indians with respect, bought land from them voluntarily, and had even representation of Indians and Whites on juries. According to Voltaire, the Shackamaxon Treaty was "the only treaty between Indians and Christians that was never sworn to and that was never broken." The Quakers also refused to provide any assistance to New England's Indian wars.